In the book Dead Girls Don’t Lie, by Jennifer Shaw Wolf, long time best friends, Jaycee and Rachel, drift apart, only to be united on the worst and possibly last day of their lives. In the months before they started drifting apart, Rachel changed in many ways, and everyone noticed. She wore different clothes, did her hair in different ways, and never wore shoes. She was barefoot when she cut her foot that night at the old house, maybe from running and slipping down the stairs after seeing her secret boyfriend, Manny’s, dead body in one of the bedrooms. Or maybe it was because she saw the person lurking in the shadows of the curtains, and she backed up and stepped on one of the shattered windows. Jaycee would never know, for that was the last time they ever spoke to each other as best friends. One night about six months after the murder of Manny, Rachel dragged Jaycee to a party, specifically, Even Crosses party. The Evan Cross who Jaycee had been crushing on for months. The night did not turn out how she had expected it to. She had expected to go, hang out with her friends, have fun, and possibly even talk to Evan. Instead, she ended up ditching her friends and Rachel. At the party, Jaycee is approached by Evans younger brother, Skylar. She found herself drawn to him. At that moment though she was being drawn into something else, danger. The theme of this book is romantic, but very creepy and mysterious at the same time. Readers will be kept captivated throughout the whole story due to the use of personal pronouns and an epic plot twist in the middle. The struggles that these teenagers face like not being allowed to go to parties or be alone with a boy are very relatable to teenagers. 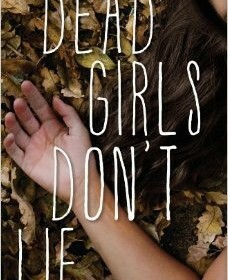 In conclusion, I would reccomend Dead Girls Don’t Lie to people who like murder mystery novels and romance.